Only this team can beat Chelsea to the Premier League title - Do you agree? 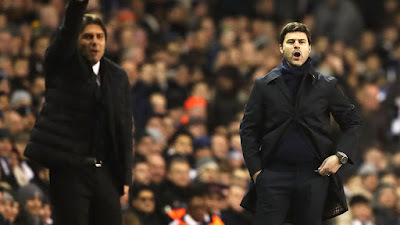 With fourteen Premier League games to go, Chelsea sit nine points clear of Tottenham, ten ahead of Manchester City and twelve ahead of Arsenal. Ray Wilkins believes that Tottenham in second place are the only side left to challenge us for the title. In my opinion it's far to early to talk of the title and we should be focusing on every game on a week-to-week basis. Let's not forget that we are still to travel to Old Trafford and Manchester City are still to come to Stamford Bridge so it's far from over. However, I will admit that taking four points from our last two games against Liverpool and Arsenal has left us in a good position. "I thought we were going to struggle, I thought we were going to have a really tough season. But all of a sudden he changes it at half-time [when losing 3-0 to Arsenal last September] to a three and all of a sudden they go on this unbelievable winning streak. And I think the only team in the Premier League, who they don’t play again, that can beat Chelsea is Tottenham. They bullied us, they beat us up at White Hart Lane and deservedly smashed us, I’ve got to say, and I think they are the only team that can beat Chelsea from here on in. "- Source: Metro. Without question Tottenham look to be our strongest challengers to the title. They figured out a way to beat us and deserved to do that on the night. As far as to say they bullied us? I am not so sure. It's all about consistency at this stage of the season and this weekend could be massive. Chelsea travel up to Burnley while Tottenham take on Liverpool at Anfield. You only have to look at the quality of the managers in charge and the fact that each of those behind us are all currently fighting for a top four finish, that each of them could set off on a long run of victories to put themselves right back in it. As we have seen this season, anyone can beat anyone on their day and we have seen some surprising results. No game is easy anymore in this league and you have to work just as hard against those teams fighting relegation as you do against your title rivals. I expect there to be plenty of twists and turns along the way but without question, it is far from over! Who do you think is our biggest threat?